One of the most irritating server configuration issues I’ve run across recently emerged when adding global MIME type mappings to Microsoft Internet Information Services 7 — part of Windows Server 2008 R2. Basically, if you have a MIME type mapping in a domain or path, and later add a mapping for the same file extension at a higher level in the configuration hierarchy, any subsequent requests to that domain or path will start returning HTTP 500 server errors. You will not see any indication of conflicts, when you change the higher level MIME type mappings, and you typically only discover the error when a user complains that a specific page or site is down. Furthermore, if you try and view the MIME types in the path or domain that is faulting within IIS Manager, you will receive the same error and will not be able to either view or address the problem (e.g. by removing the MIME type at that level, which would be the logical way to address the problem). The only way to address the problem in the UI view is to remove the global MIME mapping that is conflicting — or manually edit the web.config file at the lower level. Not very nice — especially on shared hosts where you may not control the global settings! How could a file be there — and not there? I fired up Explorer to find the file and there it was, looked fine. I’d just copied there, so of course it was there! For a moment, I scratched my head, trying to figure out what could be wrong. The file looked fine. It was in alphabetical order, so it seemed that the letters were of the correct script. With a quick scan of the Unicode code points, I quickly noticed that, sure enough, the letter ‘g‘ (highlighted) was not what was expected. 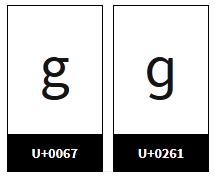 It turns out that U+0261 is LATIN SMALL LETTER SCRIPT G, not quite what was anticipated (U+0067 LATIN SMALL LETTER G). And in the Windows 8.1 fonts used in Explorer, the ‘ɡ‘ and ‘g‘ characters look identical! But then somewhere in the process, a normalisation was done on the original filename, converting ɡ to g, and thus it found a mismatch, and reported a missing usage-none.PNG. One of my favourite Windows tools is Procmon. I pull it out regularly, often as a first port of call when diagnosing complicated and opaque problems in the software I develop. Or in anyone’s software, really. 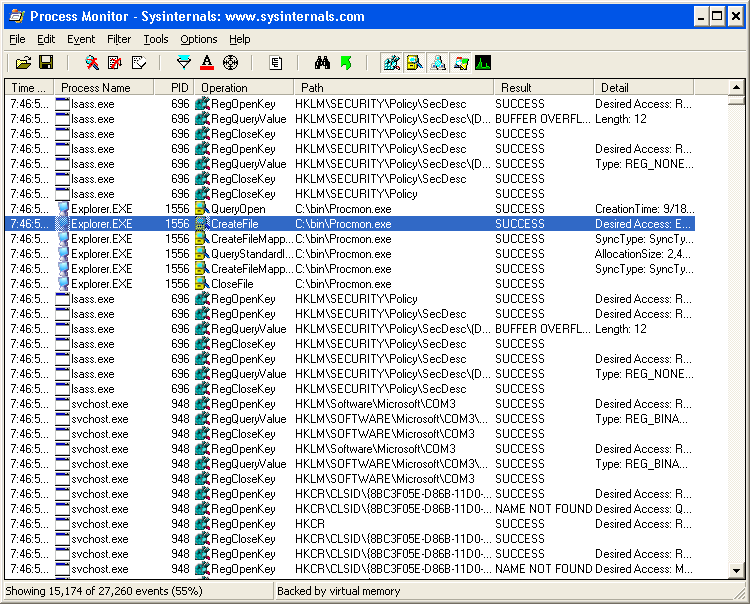 Procmon captures a trace of key I/O activities on your computer, including file, registry and network activity, and makes it really easy to spot operations that have failed or that may be causing problems. It’s great for spotting authentication problems, sharing violations, missing files and more (… malware). 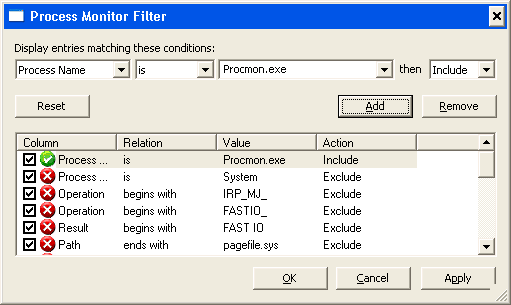 Procmon goes as far as recording a stack trace for nearly every operation it captures! Today, we were trying to diagnose a problem with a process that was taking 15 seconds or longer to start on a Windows XP computer. The normal start time for that process should have been 1-2 seconds. None of the usual culprits came forward and admitted fault, so it was time to pull out Procmon again. We quickly spotted a big fat delay in the trace. Note the time stamps in the two selected rows in the screen capture below. Now it was time to try and find out what was causing this. So we examined the stack trace for each entry, except … there were no symbols. 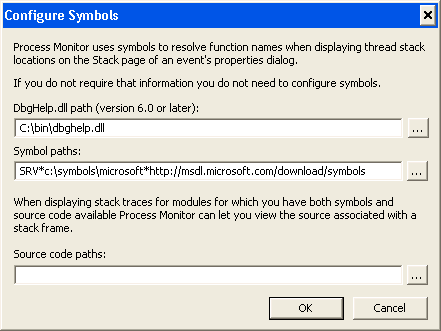 Easy enough to fix — copy dbghelp.dll from a version of Microsoft’s Debugging Tools for Windows onto the system temporarily, fixup the symbol path in Procmon’s options, and … nope, still no symbols. Now this is one area where Procmon falls down a little bit. If symbol loading fails, it just silently fails. No warnings, errors or hints as to what might be going on. This issue was occurring on a client’s computer, so it was time to take the investigation elsewhere for examination. Before we could really examine the captured trace, we needed to get symbols going. But how? That’s right, we realised we can use Procmon to diagnose itself! I booted up a clean new Windows XP virtual machine, loaded Procmon onto it, ran a basic capture of some random events. Then I started the trace, switched back to the first Procmon, and tried to examine the stack. Of course, still no symbols, but now it was time to switch back to the second, active Procmon process and see what we found. 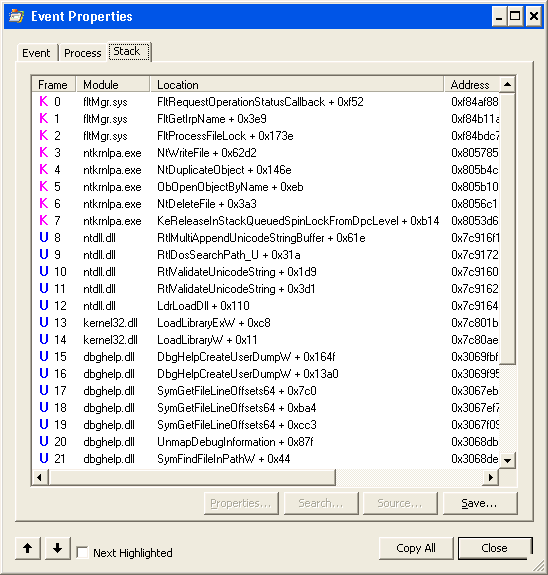 And what we found was that dbghelp.dll was looking for symsrv.dll in order to download its symbols. 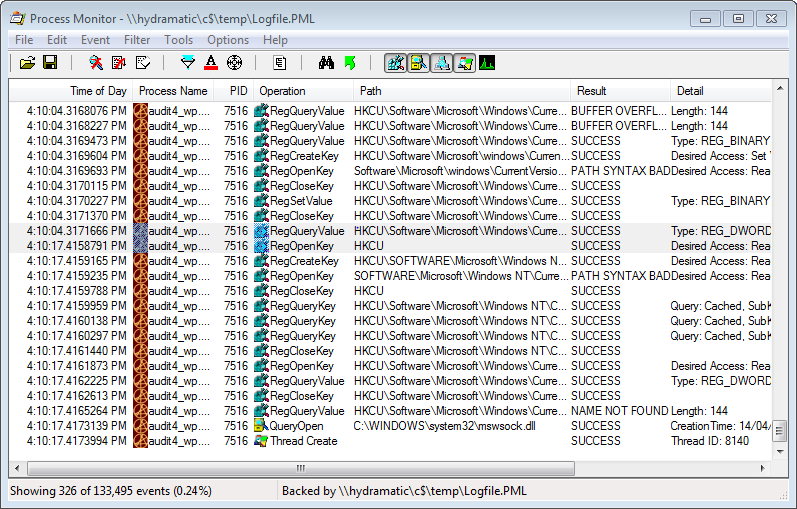 So we copied that also into the folder with procmon.exe and suddenly everything worked! The call stack with symbols loaded. Note how the function names differ from the original stack. 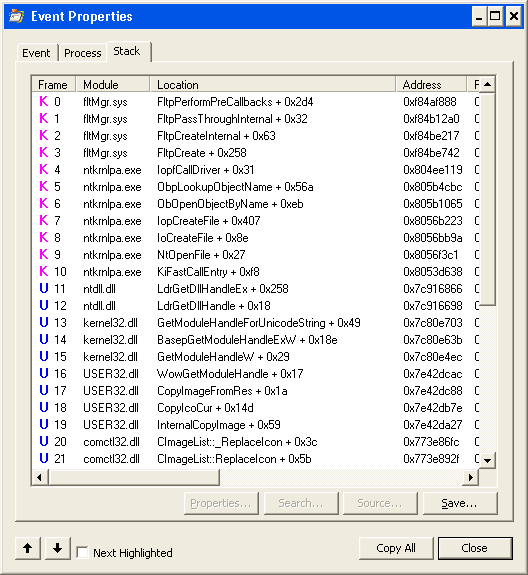 So that’s the first takeaway from this story: when you want symbols, copy both dbghelp.dll and symsrv.dll from your copy of Debugging Tools for Windows. We found no other dependencies, even with the latest version of these files. I leave that one for you to solve. Back to the original trace. We loaded up the saved trace, and found that we now got kernel mode symbols just fine, but no user mode symbols would load. In fact, Procmon doesn’t even appear to be looking for symbols for these user mode frames — either on the local drive or on the network. And this time Procmon isn’t able to give us any more detail. 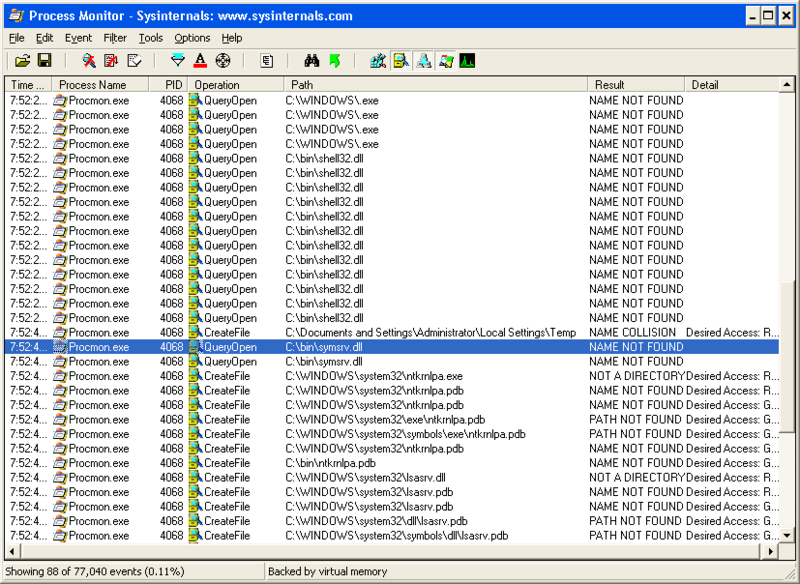 However, when we debugged the call that Procmon made to SymFindFileInPath when viewing a call stack in this log vs another new log, we found that Procmon wasn’t even providing the necessary identifying information. What information is this? 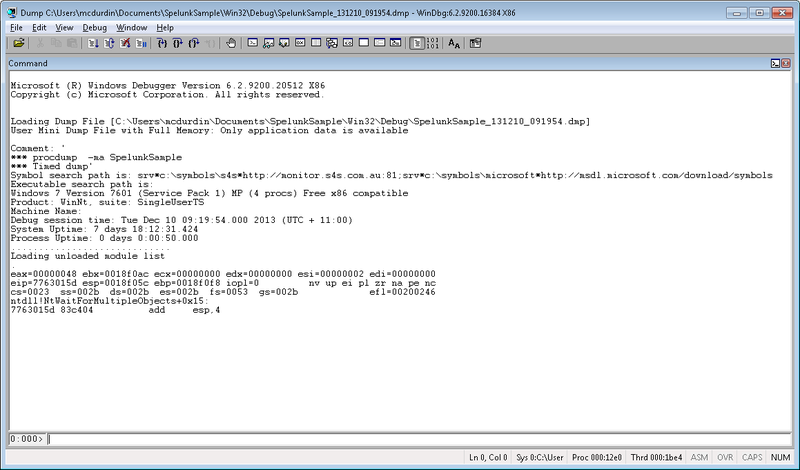 The identifying information that the symbol servers use is the TimeDateStamp and the SizeOfImage fields from the PE header of the executable file (slightly different for .pdb files). I surmise that this identifying information is missing from our original trace because this trace was captured before we copied version 6.0 or later of dbghelp.dll onto the client’s computer — meaning that the version that Procmon used when capturing the trace did not record this identifying information. Therefore, the second takeaway of the story is: always copy a recent version of dbghelp.dll and symsrv.dll into the folder with procmon.exe, before starting a trace. Even if you intend to analyze the trace later, you’ll find that without these, you won’t get full stack traces. What is teb? It’s the Thread Environment Block. The data at teb+8 and teb+4 are the current bottom of the stack and the top of the stack, respectively. This has returned exception records in two different thread stacks (0012* and 04a6*). 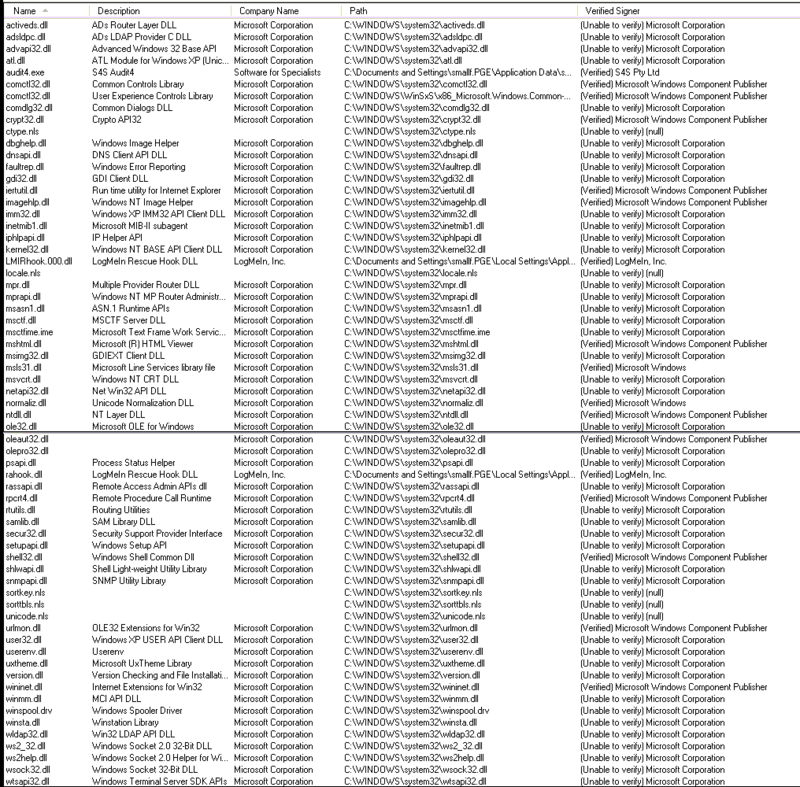 We can see a number of potential exception records; some of these are not really records (because the 0EEDFADE value is not only used in the EXCEPTION_RECORD structure; it is also passed as a parameter to the RaiseException function among others). However, if the 3rd DWORD shown is 0, then this is probably a real exception record, and not part of a function call. Why this? Because EXCEPTION_RECORD's third member is a pointed to a nested exception record, which it seems is always set to NULL in Delphi. The ExceptionAddress should point to an address within the RaiseException function (that actual address may vary between versions of Windows). 08cbb20c  "Operation cannot be performed wh"
Build this program, then load it up in WinDbg. You'll need to enable the event filter for 0EEDFADE as per my previous blog. Click the bad, bad button and watch as the exceptions are thrown. For the first two exceptions, just g. On the third exception, we'll spelunk with the search technique. 0256c32c  "Here's some extra data"
And there you have it. Knock yourself out! An application that I do some development on was having trouble starting on a Windows XP machine. In this application, we hook some of the Windows API functions internally to extend functionality in print preview (long story). However, on this machine, the hook was failing. The machine had fully up-to-date antivirus software from a major vendor; they’d run various anti-malware programs, but nothing was coming up. 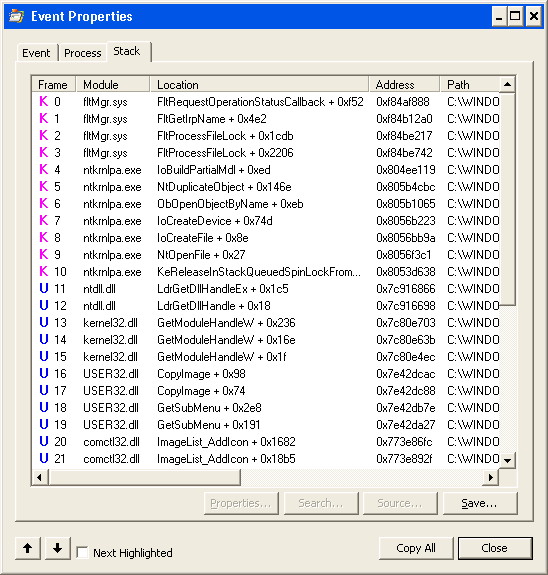 No weird looking processes, DLLs or drivers were visible using Process Explorer; it looked like a pretty clean machine. 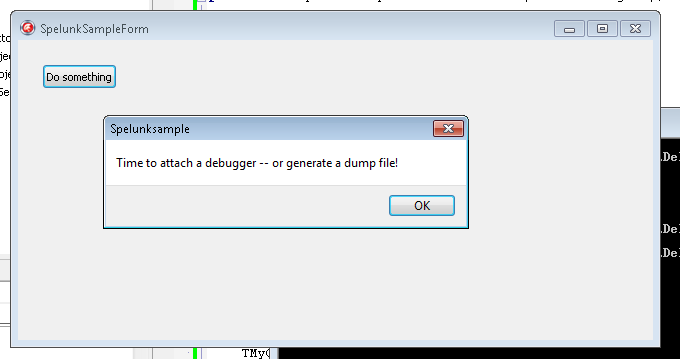 So after doing the usual diagnostics, we decided to take a full dump of the process when it threw up its error message. A debug message told us that the hook function was failing to hook RegisterClassW, RegisterClassExW, RegisterClassA and RegisterClassExA. I loaded the dump up in windbg and took a look at the functions. 00131fb8  "Coded by BRIAN KREBS for persona"
00131fd8  "l use only. I love my job & wife"
That first one was a dead giveaway. Brian Krebs is a security researcher. A Google search found that the Citadel Trojan embedded that string. To help us diagnose similar situations more rapidly in the future, we captured a few other visible details on the file system and in the registry. Images below for your entertainment! There was not a lot of point going any further. We understood why the problem was occurring, and how to resolve it (rebuild!). Given that no antivirus vendors appear to support removal of this trojan, we advised that the client rebuild the computer as the safest and most cost-effective way forward. I recently was asked whether the Delphi exception event filter for WinDBG that I wrote about would also work with x64 Delphi applications. The answer was no, it wouldn’t work, but that made me curious to find out what was different with x64. I knew x64 exception handling was completely different to x86, being table based instead of stack based, but I wasn’t sure how much of this would be reflected in the event filter. The original post contains the details about how the exception record was accessible at a known location on the stack, and how we could dig in from there. But what we can see from TExceptionRecord is that at offset 0x28 in the record is a pointer to our ExceptObject. Great! That’s everything we need. 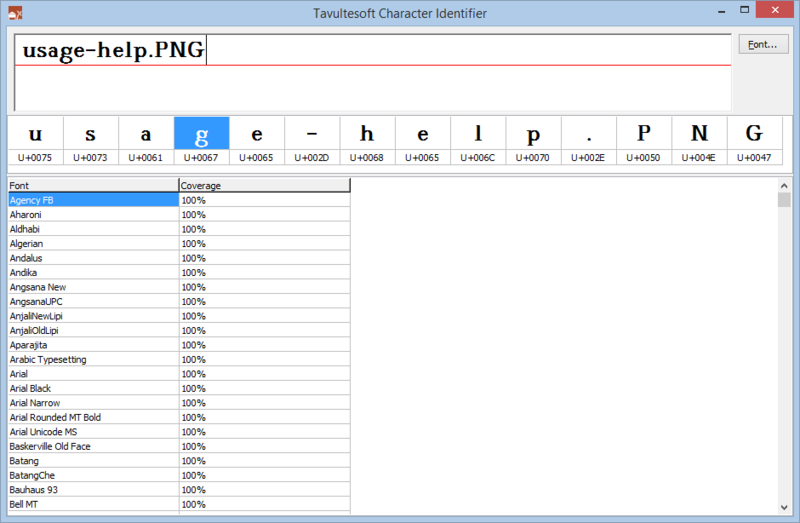 We can now put together our x64-modified event filter. 00000000`02573910  "My very own kind of error message"
rbp+48 is a pointer to the exception object (usually a type that inherits from Exception). poi(rbp+48) dereferences that, and at offset 0 right here, we have a pointer to the class type. Before we look at the class type, poi(rbp+48)+8 is the first member of the object (don’t forget ancestor classes), which happens to be FMessage from the Exception class. That gives us our message. Diving deeper, poi(poi(rbp+48)) is now looking at the class type. And we know that the offset of vmtClassName is -112 (-0x70). So poi(poi(poi(rbp+48))-70) gives us the the ShortString class name, of which the first byte is the length. So we finish with poi(poi(poi(rbp+48))-70)+1, which lets us look at the string itself. You will see that to access the exception message, I have opted to look directly at the Exception object rather than use the more direct pointer which is on the stack. I did this to make it easier to see how it might be possible to pull out other members of descendent exception classes, such as ErrorCode from EOSError. And one final note: looking back on that previous blog, I see that one thing I wrote was a little misleading: the string length of FMessage is indeed available at poi(poi(rbp+48)+8)-4, but the string is null-terminated, so we don’t need to use it — WinDBG understands null-terminated strings. Where this is more of a problem is with the ShortString type, which is not null-terminated. This is why sometimes exception class names displayed using this method will show a few garbage characters afterwards, because we don’t bother about accounting for that; the L16 parameter prevents us dumping memory until we reach a null byte. In effect the error told us that 4 out of 7 API hooks failed. I was called upon to try and diagnose the issue. Initially I looked for a 3rd party application that could be hooking the calls in question (RegisterClassA, RegisterClassW, RegisterClassExA, RegisterClassExW). But there were no unusual applications running according to Process Explorer, and no unexpected DLLs in memory in the process. After disabling the antivirus in case that was causing the problem, and running both RootkitRevealer and Procmon with no clear outcomes, I decided I’d need to go deeper. That’s pretty normal, the usual mov edi,edi that most Windows API calls start with, and what we were expecting. So I continued execution until the error occurred, and took another look at that point. Huh, that’s kinda different. Now we were jumping off into a very unexpected part of memory. A quick check of that address revealed that it was not mapped into the normal address space of any modules. I had a look at the code in question. A bit hard to know what it was doing but there was a call at the bottom there that was worth a quick look. Yep, as expected it was a jump back to the original API function, 5 bytes in. That looked like a hook library was being used because the callback to the original function was in a separate memory block. But no real info. But again, looking at the address space revealed it belonged to no known module. At this stage, it was clear we were looking at malware, so I decided to look for some strings in the data area referenced earlier (in blue, above). Initially I found only strings pointing to Application Data and other uninteresting sources. While the folder existed, I was unable to see the file oxmo.hio. This, as well as the fact that I could not see any user mode activity doing the hooking of the functions in question, really suggested a rootkit which was doing some cloaking, rather than simple user-mode malware. A reference to the string Agkead was on ThreatExpert.